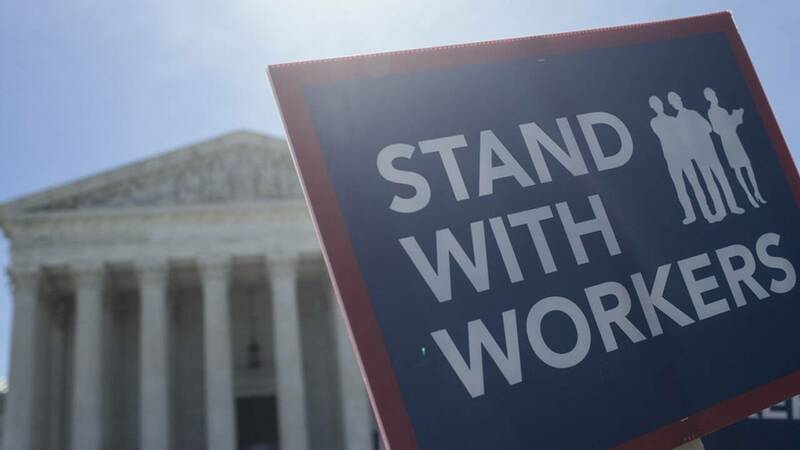 June 27, 2018 the Supreme Court ruled on Janus v. AFSCME (American Federation of State, Country and Municipal Employees) case. This is the case which was brought to the Supreme Court to decide if it is unconstitutional for public-sector employees to have to pay union dues. Which is needed to cover the cost of collective bargaining. This decision public-sector workers will not be required to pay dues to union even if the unions continue to collectively bargain for those employees. This decision will affect the membership for unions and the much-needed revenue for unions to continue to bargain and represent their membership. The power and concept for unions was created during the end of the 18th century to fight employers who were making large amount of profits, while workers slaved from sunrise to late in the evening under deplorable conditions. They fought for child labor laws, salary’s sub-standard for anyone to live, lack health care, safety rules, vacations time, overtime and through the years equal rights and equal pay for men and women. The power of unions has also opened the door for the working class for non-union jobs as well. By unions using the power of collective bargaining and by also fight on Capital Hill for so many workers proposals to become law we now have minimum wage, 8-hour day, overtime, safety, vacations and many other benefits which are benefited for many working Americans. When you lower the power of workers to sit at the bargaining table (which has just happened) it drastically reduces the ability to move forward in the future. Researchers have found that the Janus decision could reduce union membership of state and local government employees by 8.2% or 726,000 union members. This will create a loss of revenue for the unions, which will restrict unions to have fewer representatives, fewer cases going to arbitration, and organizing fewer members. Also, salaries of state and local government employees would drop 3.6%-5.4%. So why should we be concerned? Although this decision does not affect Airline and Rail workers yet, but it does have the potential to affect us in the future. This administration has the power to carry the Janus case further, it could affect us as well. The current Supreme Court has proven that they have the majority of judges that will act just as we have expected. Which is to continue to do everything in their power to eradicate unions. This has been a goal from the Republican party for decades. Big business billionaires have been giving millions to candidates with the hope to get elected those who will follow through on the eliminations of unions. The elimination of unions from big business will result lower pay, less or no health care, no job protection and all of the other many benefits that have been fought for over 130 years and generate an obscene amount of profits for the already top 1%. We need to stand strong and continue to fight back, your future and the future for your children for generations to come depend on you. Please, get involved, go to your union meetings, don’t let this happen to us. July 4th, Happy Birthday America!